Why Noise is a Menace? Open offices are one of the great ways to efficiently use space and also to promote teamwork. But this is not pleasant for employees all the time as they have to endure office noise due to external factors especially from fellow employees. If you have noisy people around who are exceptionally loud and does not allow you to work properly, then try to find other types of distractions that would help you to stay focused from such noises. This also results in an improvement in your mood and behaviour towards your peers and also guarantees an improvement in your performance. Sound not only affects ones mood and personality but also blocks the person’s ability to think. Bad acoustical designs can lead to stressful environments for employees and can also reduce productivity. The cubicle was first introduced with the idea to promote privacy, to increase productivity and also a place where employees could pin up documents or memos vertically to the walls. But the introduction of such cubicles created an opposite effect as many employees complained that the open space offices and the cubicle culture often led to the invasion of their privacy, loud noise and feeling congested during work. Many people who work in an office often fail to recognise this as a problem, since prolonged exposure to noise can lead to low tolerance, high increase in frustration levels and also it can also have side effects such as build of stress within the employee. People who are introverts or who are perfectionists often find themselves performing poorly in a noisy office. Extroverts usually enjoy work while listening to noise while introverts are the opposite. But from both the studies, it is seen that both the personality types are affected by noise, interruptions and distractions. Also, such sounds can also affect the type of tasks that they are doing. Simple and mindless tasks such as surfing the web can be done in almost any environment – be it noisy and loud or in a quiet and secluded place. This is because such tasks do not demand much mind attention from the user. This is not the case for people who are doing more complex, logical and difficult tasks such as programming, engineer writing, content writing, testing or such. Those tasks require a lot of thought process and reasoning from the user. Concentration is very fragile while doing such tasks. There are many ways in which one can reduce the noise in the workplace up to an extent so as not to cause any kind of distractions to others. 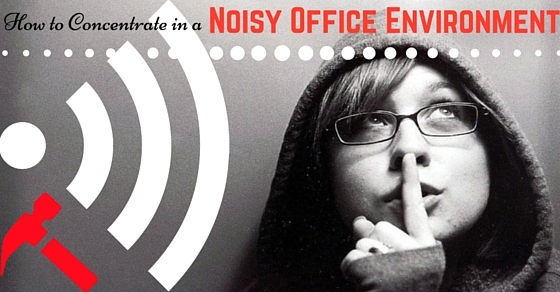 Employees can try to prevent loud noises by a method called as “passive aggression”. This can enable the employees to face the problem more directly. Try to talk to the person and confront to him about the problem directly. Most of the times, people will try to cooperate. But these kinds of methods only work for some time since these kind of problems are bound to happen from time to time. Noise cancelling headphones can be used to eliminate noise levels at work, since it uses noise to fight with noise. These kinds of headphones work with low frequency noises such as the engine noise from an airplane. But this does not work well with voice frequencies as it can be used to lower the intensity of the opposing noise. It is more of like a tone adjustment rather than tone cancellation. If a person is unsuccessful in blocking noise, then the next best method is to absorb the noise. This can be achieved by using any kind of acoustical barriers or any kind of anti-noise materials. Masking depends on the fact that to reduce the opposing noise it uses the same frequency noise and aims it back to the source. This can eliminate the noise up to an extent but not all the way, since the source noise is till much stronger than the reflected noise. A number of companies sell such anti-noise systems. These are usually placed between two succeeding cabins and the ceiling so that there should be no intrusion of voice frequency into the cabin. Many office workers adapt such conditions by playing music through personal stereos or work computers. But the drawback of such method is that while playing music, especially music with lyrics, it might distract other employees. Also, others might also distaste the taste of the music played. Always try to understand the times when the office is noisy and do easy tasks at that moment. Or you can move to a quieter place such as the library or an empty conference room where you can do your work in silence. Working in a quiet room can also give you more confidence and concentration in getting the job done. In reality, it might not always be possible to move away from your desk to do work. The best method is accepting and adapting to the surroundings or if it not feasible to you, try talking to your supervisor about the matter, if that helps. White noise is used as a method to stop crying in babies. This is a form of static noise used to block office background noise if used white noise for office. If white noise does not suits you try using various other noises such as pink noise, brown noise and grey noise. These noises are readily available in the internet and can be downloaded easily. This is also a great method. Try to put on headphones but do not play any music, this muffles out any unwanted noise and acts as a barrier, though complete noise elimination is not guaranteed. Try doing breathing exercises. This helps in achieving peace and tranquillity to the mind. This is a simple yet effective method to clear the mind. Try to locate a quiet place and start in a comfortable position. Try to concentrate on your breathing and then focus only on your breathing, this helps you to concentrate and resonate with your inner self. With timely practice and concentration, you will be able to meditate for long periods of time. Try to focus on a single object such as a candle or a book and concentrate only your happy thoughts on it. Try not to concentrate on distracting sounds. This method helps you to concentrate in your work even if you are present in a busy environment. Whenever you find yourself distracted by noise try to think of an image that gives you tranquil and serenity. Usually people think about sceneries such as an ocean, or a snow capped mountain or a spring scenery, where sheep grazing on green meadows. Try to focus on positive thoughts and what brings you happiness. Consider this as a form of spiritual practice, alternatively, try to focus your mind on quotes that makes you happy. Surround yourself with the sounds of water. This calms your mind and soothes and releases any build up stress. Being thirsty and hungry can reduce your concentration in doing work and will make you more vulnerable to noise and stimuli. Try to eat healthy foods such as fruits like apples or oranges and vegetables. Junk food is also rumoured to decrease the attention span due to its high sodium content. Hard flooring surfaces such as hard wood, tiles and porcelain or ceramic can cause a large amount of noise pollution due to the sound that its reflects. Such noise disturbances can be reduced by using carpets and vinyl flooring. Carpets are the ideal solution for absorbing sounds while vinyl is a better alternative since it is easy to maintain and clean up. A quiet sanctuary is always beneficial for employees who want to escape from the hustle and bustle of the office. While conference rooms can be a makeshift sanctuary, these rooms are not always reliable. Every office should have their own dedicated space for employees to work quietly. For example: A soundproof room is always a good option. Another good method to control unwanted sounds is fighting noise with noise. This can be done by playing white noise at the background at an ambient level, so that the unwanted noises can be muted up to a certain level. Such white noises include sounds of waves crashing onto the beach or the sound of rainfall. This is a counter effective method. Wearing noise cancelling helps to reduce the noise up to a certain extent. Most employees purchase a pair of noise cancelling headphones from a reputed brand. The main drawback of this method is that most of the noise cancelling headphones are really expensive. Furniture made of cloth or any sound absorbing material can be used to absorb any unwanted noise. For examples: couches, sofas, lounges and cabinets can have a definite impact on the acoustics of the building. Moreover, using high backed couches is a fine way for blocking surrounding noise. Try to plant plants around the corners of the office or places where sound might echo. Plants have a great impact on reducing noise in offices, the bigger the plant the better. Also, these plants provide an aesthetic beauty to the office. Changing the office layout and rearranging the desks and machinery helps in reducing and controlling sounds. Desks should not be cluttered in one area as it could concentrate the noise and moreover, machinery like printers, fax machines and the rest should be kept in a different room. Sound absorbing acoustic panels can be fitted to reduce the noise. The panels include certain shapes which helps in cancelling out the noise echoed within the room. These kinds of panels are a bit expensive than the usual wall furnishings. Sound insulation can be done effectively to reduce unwanted sound. Though it is time consuming and costly, this is the best method to reduce noise when doing renovation or upgrading the office. Though a tried and tested method, cubicles have been used over decades as a way for employees to work quietly. Although, this method has its own limitations and drawbacks, it is still followed in many countries. 1. It should be effective at masking speech. This includes having a broadband spectral content, so as to block voice frequency. It should be spatially diffused, so that it can block noises coming from any direction. 6. It should be user adjustable. The distinction between noise and sound depends on each individual. The two main advantages of a good acoustics is to concentrate on the given work and the ability to listen to your own thoughts. Noise is a productivity issue as much as it is a sound issue.